A seafood starter is a always a popular choice when catering for pescatarians or meat eaters - and for good reason. The dizzying array of fish and shellfish on offer - from meaty monkfish to elegant scallops and vibrant prawns - brings with it an incredibly varied collection of seafood recipes, meaning whether you’re looking for a delicate summer starter or something rich and comforting to begin a warming winter meal there is bound to be plenty of inspiration to be had in this collection. Scallops are a popular choice to start a dinner party as they not only look and taste beautiful, but carry connotations of luxury to make your guests feel special. 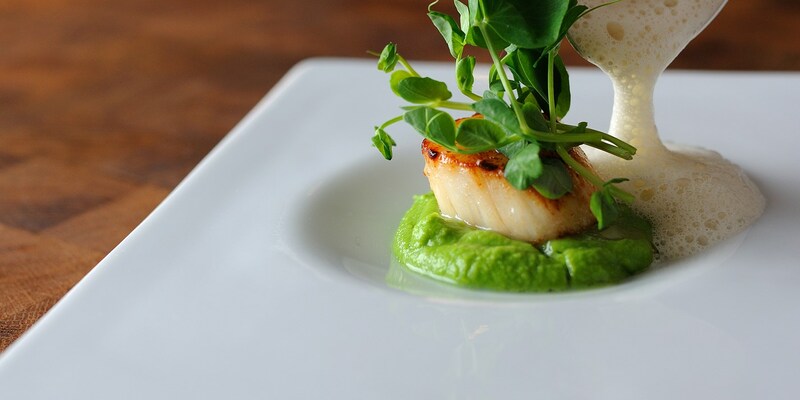 Chris Horridge's Scallop recipe, which fuses the sweetness of peas with a surprising piquant hit from cumin, is bound to impress, or try Marcello Tully’s classic French Scallop mousse for a rich seafood starter. Salads are a perfect option for lighter seafood starters to make sure people have enough space to consume their entrée. Present a zingy Crab salad to impress your guests with Andy Waters' recipe, perfect for warmer months, or go retro with Chris Horridge’s take on the classic Prawn cocktail. Ceviche, a cured fish dish originating in South America, makes a wonderful light, healthy starter - try Martin Wishart’s signature Halibut ceviche recipe which pairs the fish with mango and passion fruit.